Sugar: Are There Any Local or Sustainable Versions? Dear EarthTalk: I am a bartender in Sacramento and I would love to be able to use some sort of locally made or sustainable version of sugar. What’s out there? It sure would be nice if we could obtain all of our food and drink items from local sources, but sugar provides an excellent example of why such a desire may remain a pipe dream in the United States for a long time to come. The sugar we consume that is produced domestically comes from sugar cane grown in Hawaii and the Southeast and sugar beet from the Upper Midwest, Pacific Northwest, California and elsewhere. However, it is likely milled and refined hundreds if not thousands of miles from where it is harvested, and then shipped all over the country—causing untold greenhouse gas emissions—in various sized packages for our consumption in our coffee, on our cereal and, for some of us, in our cocktails. The rerouting of South Florida’s fragile water table to irrigate thirsty sugar plantations contributed to the decimation of the Everglades, one of the nation’s most unique and diverse ecosystems. 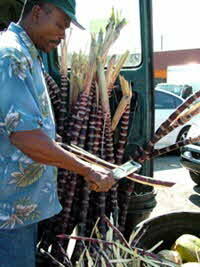 Pictured: A Florida sugar cane and coconut vendor prepares some raw sugar cane. Massive government subsidies and land giveaways to the sugar industry in the American Southeast beginning in the early 18th century established a market for American-grown sugar despite the fact that the region’s climate was not tropical enough to grow cane efficiently. To add insult to injury, the rerouting of south Florida’s fragile water table to irrigate thirsty sugar plantations contributed to the decimation of the Everglades, one of the nation’s most unique and diverse ecosystems—and now the subject of a multi-billion dollar restoration effort. While you might be hard pressed to find commercially available local sugar anywhere in the U.S., you could make your own. “Years ago, when sugar was an expensive commodity, many people of lesser means made their own sugar from sugar beets,” reports writer Kat Yares on the eHow.com website. “Every farm and every home garden had a spot reserved for beets, and a day was set aside to cook the beets down into sugar.” While very few of us grow our own food these days, growing sugar beets and making sugar from scratch can be a fun, educational and tasty project for parents and kids or for foodies intent on local sourced, preservative-free ingredients. Yares explains the whole process in her “How to Make Sugar from Beets” article on eHow.com. If that all sounds like too much work, perhaps you can settle for store-bought organic sugar, which may not be local but which is at least produced without chemical pesticides and fertilizers. Florida Crystals, Hain, C&H, Domino and others each offer organic sugar varieties in many traditional grocery stores coast-to-coast. There are even more choices at natural foods specialty stores (like Whole Foods). Believe it or not, there are even vegan sugars out there—that is, sugars not processed with animal-derived bone char in the refinement process. While sugar itself may be a staple item for many cocktails, some interesting alternative natural sweeteners, some of which may be locally sourced in your region, do exist. Agave nectar, honey or even maple syrup are some options that might just give that Tom Collins the extra kick it needs to make it stand out from the other bartender’s drinks down the street—or in your breakfast cereal, for that matter.